Brett Netzer led the offensive attack for Salem, delivering three hits in his High A debut. Netzer, Boston's third-round pick last June, added an RBI and scored a run. Catcher Jhon Nunez drove in a pair and stole a base as part of his 1-for-3 evening. Roniel Raudes was solid on the mound in his opening day assignment. After a solid-but-uneven campaign as one of the youngest players in the Carolina League in 2017, Raudes is in his second go-around with Salem. He allowed a run on five hits in five innings, striking out three and walking two. Daniel Gonzalez was extremely impressive in relief, striking out 10 of the 15 batters he faced, allowing one run in four frames. Jhonathan Diaz was outstanding in his 2018 debut for the Drive. The 21-year-old left-hander struck out nine in six shutout innings, surrendering only two hits and walking one. The nine strikeouts are a career high for Diaz, who had reached eight in a game five times previously. Devon Fisher struck out a pair in two hitless innings of relief. The 13-hit onslaught by the Drive was keyed by leadoff man Kervin Suarez, who went 3 for 4 with a walk. CJ Chatham had a pair of hits and a walk as he works his way back from an injury-marred 2017 campaign. Perhaps most importantly, Chatham got the start at shortstop, an encouraging development after his throwing was limited in spring training. Pedro Castellanos, who joined Chatham in the SoxProspects.com Top 20 in the newly-released rankings, also had a pair of hits. The Pawtucket Red Sox are set to open their 2018 season on Friday at 7 p.m. against the Lehigh Valley Iron Pigs (PHI) at McCoy Stadium. Player of the Day: Opening Day saw several candidates worthy of recognition, but the nod goes to Greenville starter Jhonathan Diaz. 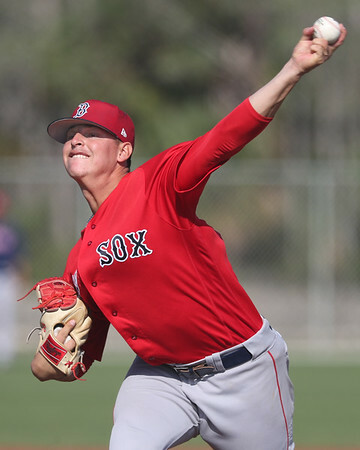 The lefty opened the season by retiring the side in the first inning and didn't slow down on his way to a scoreless six-inning, nine-strikeout victory.